Learn how you two can reach your retirement goals without sacrificing fun now. 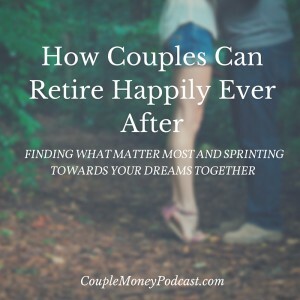 Roger Whitney, The Retirement Answer Man, comes on the podcast to help you plan your retirement. What’s Your Happily Ever After? Not talking about the fairy tale where you come into a windfall from a distant relative whose left their fortune. What are you looking forward to? What do you want to do in the next few years? Can you describe how you want your retirement to go? Whether you have a clear picture of what you want or you’re just starting to think about it, today’s episode will be a fun listen. Roger Whitney, the Retirement Answer Man, will be on to talk about retirement, and what that actually means for you. Subscribe to Couple Money Podcast via iTunes, Stitcher, or copy this link to usewith a podcatcher of your choice. You can also chat with me on Twitter and Facebook. Even though Roger has the intellectual chops to handle finances (he’s a Certified Financial Planner, Certified Private Wealth Advisor, and Accredited Investment Fiduciary to mention a few), his real strength is his holistic approach when helping clients. He is also the creator and host of The Retirement Answer Man, a weekly podcast helping listeners plan a path towards their ideal retirement.